Offering excellent build quality, fibreglass (GRP) step ladder is designed for heavy trade use and is non-conductive to 30,000 volts. If you need to carry out electrical work in a sensitive area then having the right equipment is paramount. GRP Step Ladder Hire is perfect for working at one level for a short period and even include a solid standing area and knee rail for extra security. If you need peace of mind while working in a zone 1 areas then this is the ideal product to help you carry out maintenance safely and effectively while eliminating the risk of injury. The equipment is also suitable for heavy trade use and is non-conductive to 30,000 volts which means you can work in high voltage areas such as data rooms and telephone exchanges where using standard products could prove to be too dangerous. GRP STEP LADDER HIRE SPEC. Safety tested to BSEN 131 and certified. Integral tool rack on the top rung to hold tools and fixings. Cross braced rungs for extra rigidity. Any working area where there is risk of an explosive atmosphere on a day-to-day basis including oil refineries, power stations and the gas industry is classed as a ‘zone 1 environment’. It can also indicate areas within the industrial sphere that may hold a greater risk from fire, electrical or chemical hazard. ‘Clean’ environments with stringent hygiene and safety requirements which are used for food production and hi-tech manufacture are also included in the zone 1 environment. The advantages of a Grp fibreglass step ladder speak for themselves. All the products are safety tested to BSEN 131 and certified. The step ladders are specifically designed for professionals working in a demanding environment and consist of double riveted treads for extra strength. An integral tool rack is included on the top rung to hold tools and fixings and the treads and feet are slip resistant for safety along with cross braced rungs for extra rigidity. 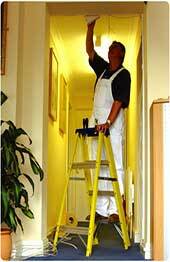 The step ladder is also available in three sizes enabling you to reach a height of up to 3.1 metres. GRP Step Ladder Hire has never been easier, order online today or call our hire desk team and you can have your GRP Step ladder by the next day.